Photography once again shows why it’s the superior form of art. While I enjoy paintings and sculptures, neither can do what a photograph can. 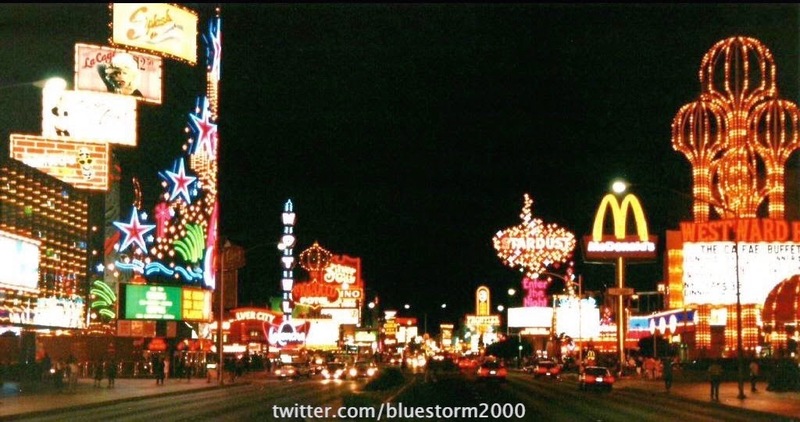 Case and point, in the wake of the news that Riviera will not be with us much longer, @bluestorm2000 shared a picture he took of the strip in 1996. The photo was specifically taken in the middle of the street, in between Riviera and slots of fun, looking south. What is absolutely fascinating is by the end of 2015, 23 years since this picture was taken, nothing found in this picture will exist. Literally none of it. While I didn’t Visit Vegas for the first time until 12 years after this picture was taken, it has the amazing ability to take me right there. It somehow simultaneously looks familiar and foreign. Watching iconic properties slowly disappear from the strip gives me an even greater appreciation for Fremont St and how, no matter how much things change, is the only place in Vegas that holds onto its past tightly. While it will be sad to see Riviera go, Vegas continues to be the worlds most popular vacation destination because properties that can’t draw people to her have to go in favor of attractions that will. It’s hard to imagine north strip ever becoming relevant again however if you are looking for optimism, look no further than south strip. What was once considered to be a remote location devoid of options, just like north is regarded today, Tropicana & Las Vegas Blvd is now the business intersection in the United States.